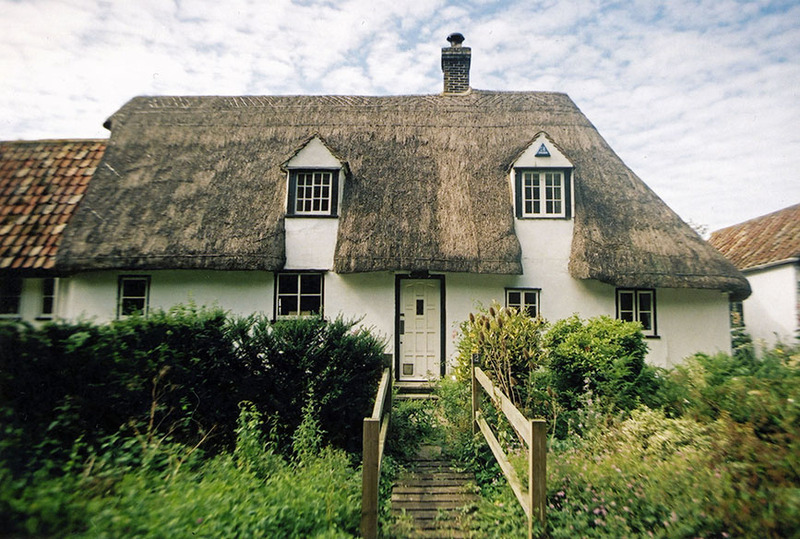 As The Years Go By… Maintaining a Thatched Roof. 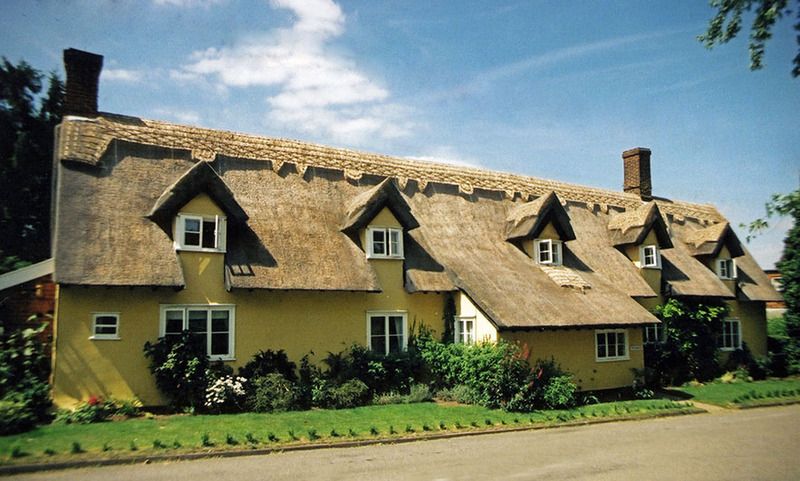 Over time a thatched roof will need more maintenance than other forms of roof covering. This regular attention is essential in obtaining the maximum life from a thatch. Thus knowing what is required, to prolong a roof’s life as it slowly deteriorates, can be useful. Those who live under roofs, thatched using the directional method of work; where the thatch is fixed from the outside or is roped down, have little to learn. As their roofs simply need a complete replacement every few years. 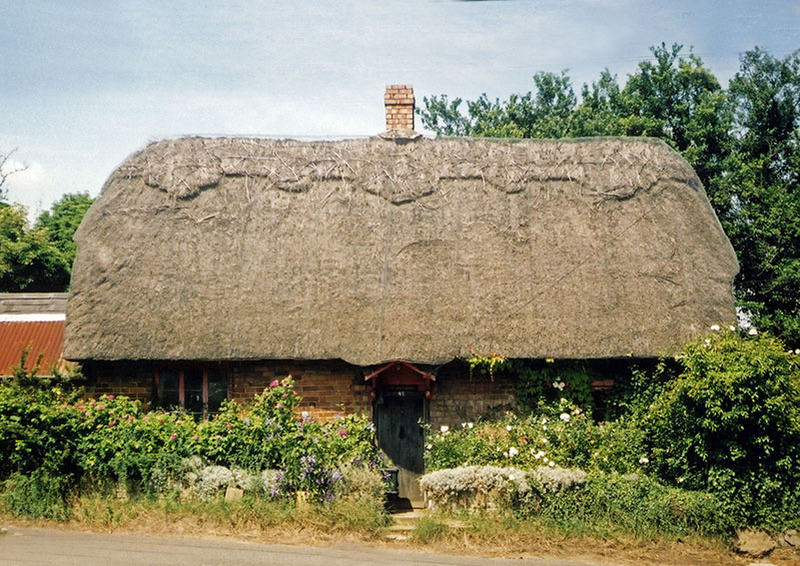 But for the majority, under standard thatch, the road to renewal is much longer and more complicated. 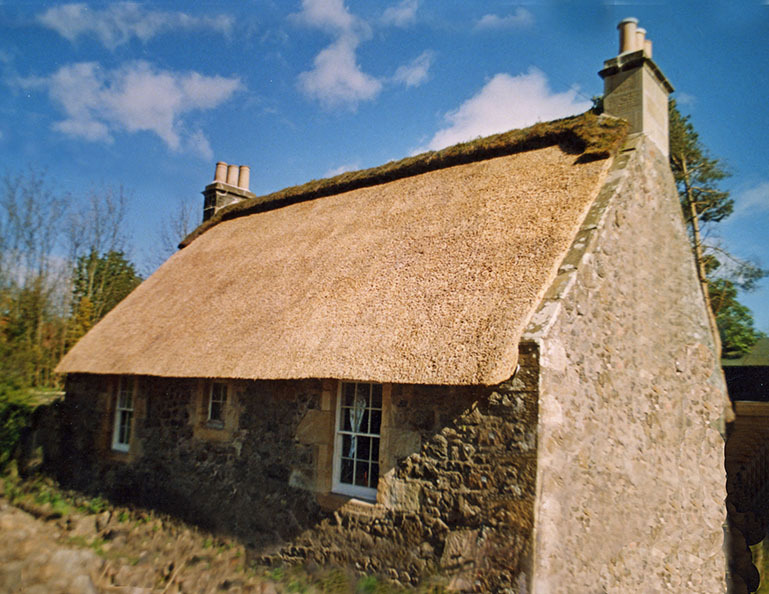 Standard thatching consists of the coatwork and the topmost ridge. Where this ridge is of timber boarding or mortar, the two parts of the roof last much the same time. But where organic materials are used, the ridge never lasts as long as a new coat of thatch. Renewing these ridges is the most common maintenance a thatch requires. 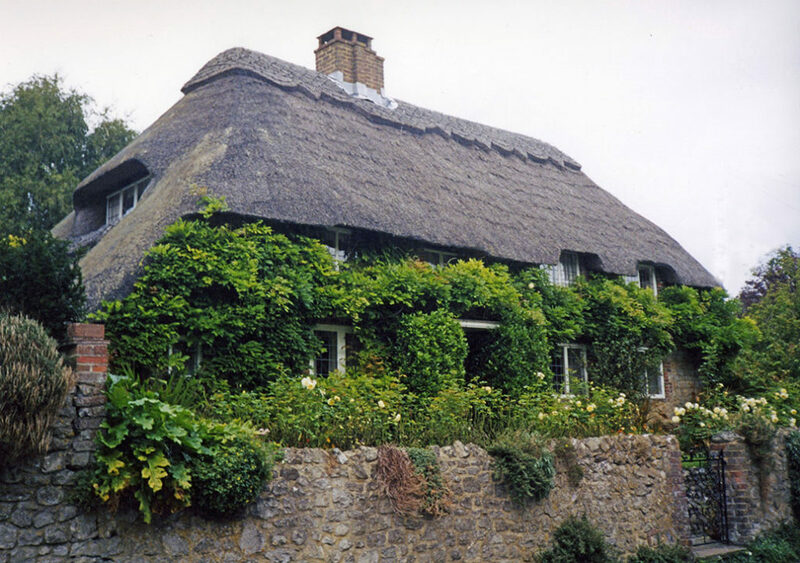 In fact a great deal of a thatcher’s time is taken up with reridging thatched roofs of various ages. Thankfully for the thatchowner, the cost of a new ridge is much much less than the price of a new roof. The cost depending a great deal on what type of ridge is required. As described in the page on Ridging, there are two main types of cereal straw and sedge grass ridge. 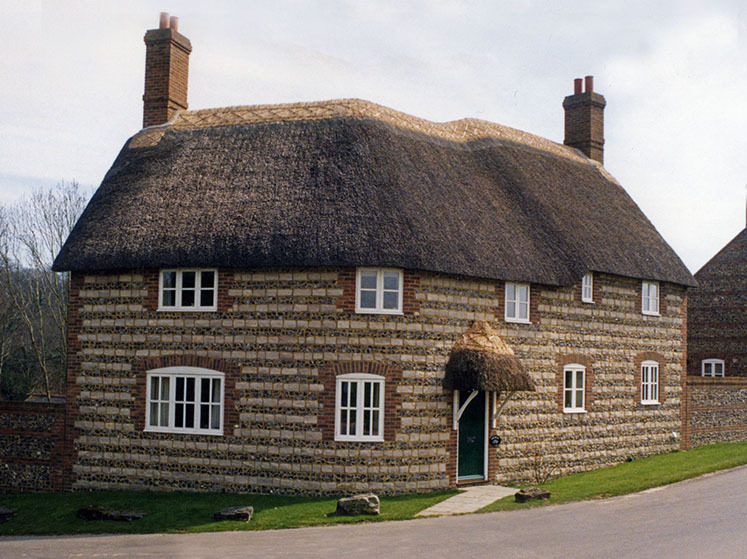 The more basic and traditional type, known as a Flush Ridge; does as its name implies and lies flush with the main thatch. The other, the Block Ridge stands proud of the main thatch. Those of an ornate design, become Ornamental Block Ridges. Both the straw and the sedge grass ridges are held in position by long wooden sticks, commonly called Liggers, these in turn, are held down by wooden thatching spars. Turf ridges rely on their weight to keep them in position. Providing a cost effective and stable finish, but they are now surprisingly few in number. Reridged… An ornamental block ridge, at Lindsey in Suffolk. And a plainer flush one,below, on a decade old building, at Higher Bockhampton in Dorset. Both using cereal straw…These ridges will soon tone down to the colour of the older coatwork. When the liggers and spars wear out, the ridge needs replacement. No matter how plain or complicated that ridge may be. (Sedge grass ridges can sometimes be Resparred, and given another lease of life.) So with an ornamental ridge, the thatchowner is paying for looks and generally not longevity. Often the ridge is covered with wire netting, helping to prolong it’s life, by holding things together for a while after the wooden parts have weakened. As the ridge shrinks away within the wire a ghostly image of past glories is retained; a sure sign of decay. On the way out? Only the ridge… The main coatwork on this cottage, at Wappenham in Northamptonshire, looks more than capable of seeing out at least one more ridge. 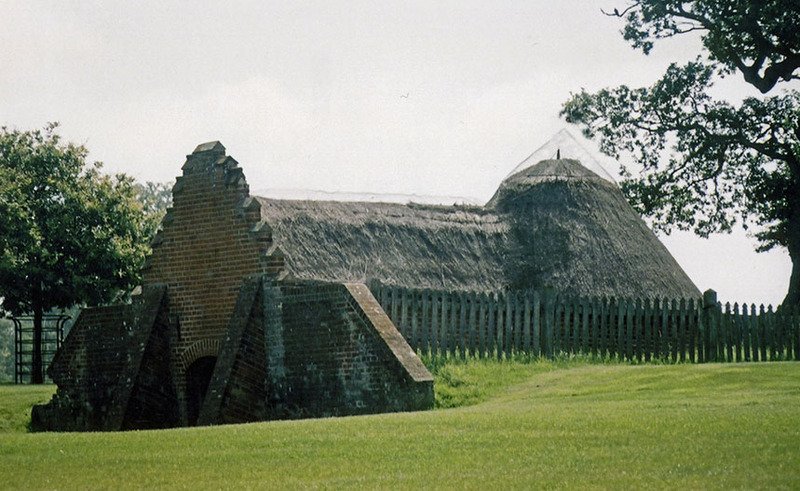 Gone but not forgotten… Only the wire netting shows were the ridge, on this ice house in Suffolk, once stood. But things are not beyond redemption. As long as the main coatwork is still sound, a new ridge could soon be fixed. In an ideal world, the ridge should last the same time over it’s entire length, but this is rarely so. The elevations of the roof most exposed to the weather, will wear faster than the sheltered sections of thatch. Also, any parts of the ridge carrying extra water will decay faster still. This causes sections of the ridge under any chimneys to often need early attention. As the opposite image shows, at Avebury in Wiltshire. Here the owners have wisely combined the work, with fixing a new television ariel. These small ridging jobs around chimneys, are usually the first work needed after a rethatch. But between seven and twelve years may have already passed. Depending on location, between around ten and twenty years will have slipped by, before the ridge needs a total replacement. As the ridges come and go, the coatwork itself slowly wears back to it’s fixings. It is now that the skill of the original thatcher will become apparent, as hopefully this process takes many years to complete. As the fixings near the surface of the thatch, they often appear as lines or little holes in the roof. This is caused by the layers of material being opened slightly, as the line of fixings slowly appears. And is a useful early warning that the roof has only a few years left, before repairs or a rethatch are needed. When the fixing becomes exposed it will itself decay, making the thatch loose. Water will also often run down the fixing, causing a leak. 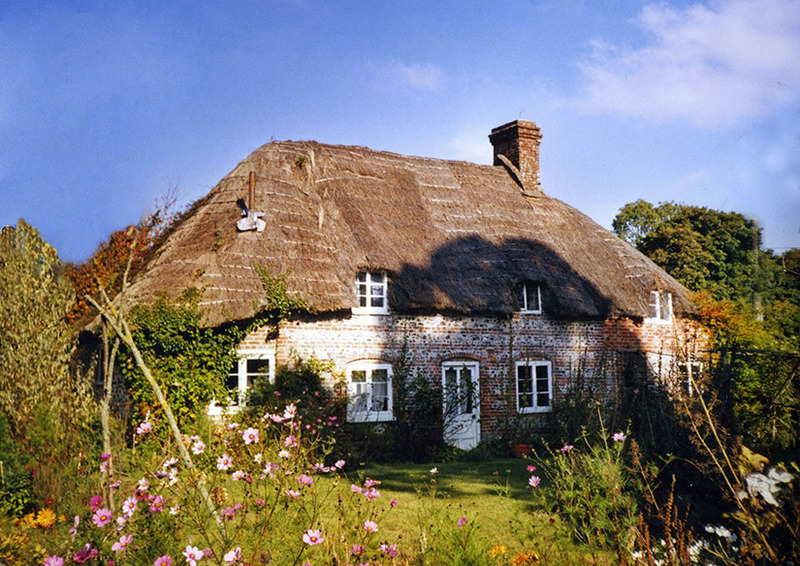 Some early warning signs… For this Sussex thatch, at Amberley, coated with combed wheat reed. The lines of the thatch fixing are just beginning to show. This hasn’t stopped a new ornamental block ridge being completed. By the time that has worn away the main coatwork will probably need replacing. Or repairs carried out. 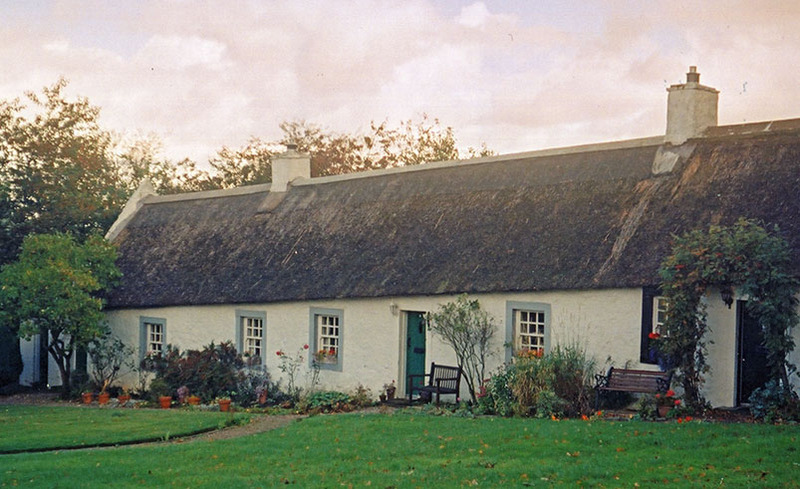 The same factors that shorten the life of the ridge also affect the main thatch roof. The sheltered elevations will last longer and the coatwork, under chimneys, will wear that more quickly. As will any valleys or areas of roof with a less than an ideal pitch; such as the tops of dormer windows. 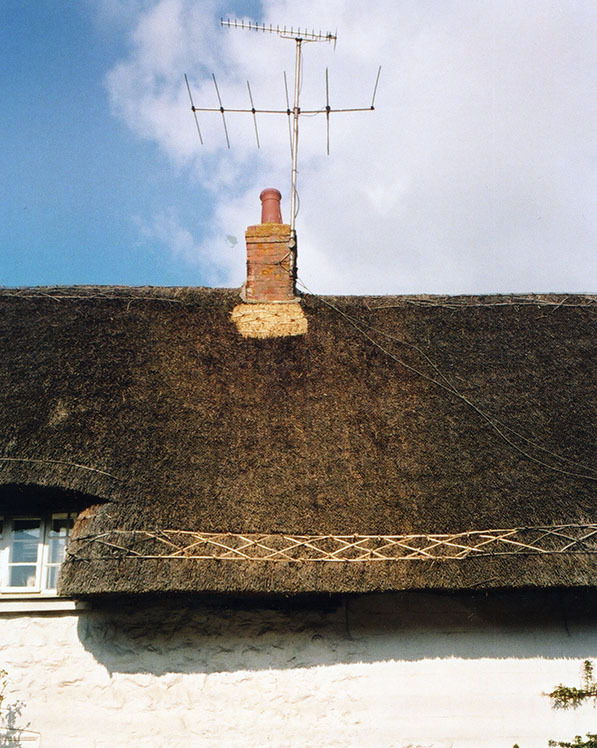 Reridging and repairs… Neatly done, on this long straw roof, at Fulborn in Cambridgeshire. As ever, the thatcher has repaired under the chimney and also provided a much wider ridge… Thus allowing the whole roof to soldier on. Wire netting is often seen covering the coatwork as well as the ridge. There is no doubt that this helps to protect the roof, especially from the attention of birds. As with a ridge the roof will also shrink away from this covering over time. Work in long straw is invariably covered thus. Combed wheat reed often only has the edges of the roof covered. New water reed is rarely done; but does benefit from a coat of netting as the years go by. Birds may not be able to pull out the thatch, but they love excavating into a soft, oldish coat for insects, often causing considerable damage. The downside, apart from the cost of the wire, is the future cost in removing it; for any ridging or repairwork. It also collects litter from any overhanging trees. But especially on old thatch, wire netting helps a great deal.